According to Variety, Leonard Nimoy’s son, Adam, is planning to honor his father’s memory with a documentary titled For The Love Of Spock. A filmmaker in his own right, Adam Nimoy began working on the project with his father shortly before his death earlier this year, and he says the film will also celebrate the 50th anniversary of Star Trek—which is coming up in September. Also, out of respect for Mr. Nimoy, we will refrain from referring to this movie as a “Spockumentary,” even though that’s super clever and funny. Zachary Quinto—who plays Spock in the new Star Trek movies—will narrate the film, and William Shatner has agreed to make some sort of appearance. 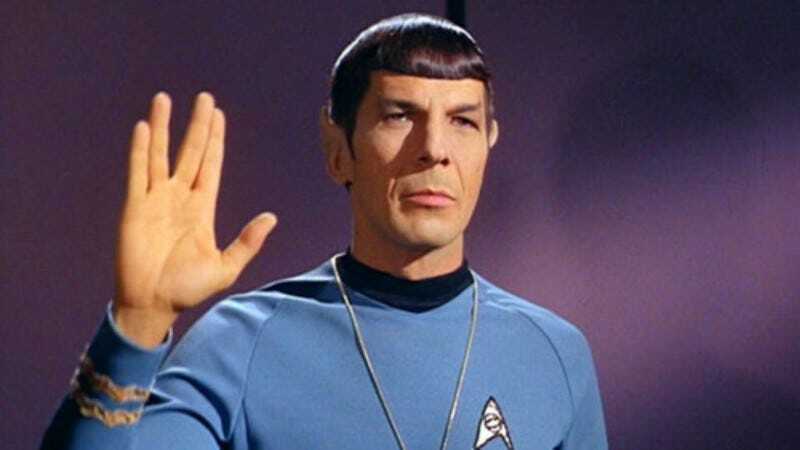 Adam Nimoy says it will touch on things that his father covered in I Am Not Spock and I Am Spock (his books about not being Spock and being Spock, respectively), as well as years and years of audio recordings that feature Leonard Nimoy talking about Spock. Variety says Adam Nimoy is currently trying to finance the film through a traditional studio (so he can afford to pay for clips from Star Trek and whatnot), but he’s open to setting up a crowdfunding page if it comes to that. Considering how much money people are throwing at Super Troopers 2, we can’t imagine a movie about Leonard Nimoy would have any trouble with an Indiegogo or Kickstarter campaign.